Rossana Rodriguez Sánchez grew up fighting for local rights and political independence in Puerto Rico. Now she is tapping that experience in her bid to unseat a politically entrenched incumbent and fight for reform in Chicago’s City Council, as a candidate for 33rd Ward Alderman in the city’s April 2 runoff elections. Railing against the Chicago Democratic Machine, Rodriguez Sánchez, 39, a community organizer and educator, has made “people-driven politics” her main prerogative. Rodriguez Sánchez clinched the most votes in Chicago’s non-partisan primary on Feb. 26, coming 8 percent shy of the 50 percent majority needed to be elected without a run-off, and foreshadowing what will likely be a tight race on April 2. While many Chicagoans and the national media are focused on the runoff’s mayoral contest, where two African-American women are facing each other, City Council runoffs in wards like the 33rd on the Northwest side will also be crucial to the well-being of lower-income, immigrant, and other residents in Chicago. 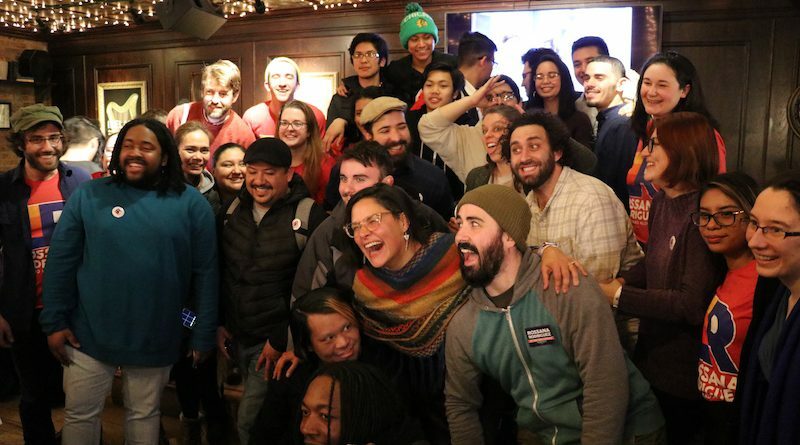 These aldermanic races will ultimately determine whether the 50-member City Council will advocate for working families across the city, said Candis Castillo, the organizing director at United Working Families, a community-based political organization that endorsed Rodriguez Sánchez. The 33rd Ward encompasses parts of Albany Park, Ravenswood, Avondale, and Irving Park, with Latinx families making up the majority of residents. Rodriguez, who grew up in Humacao, Puerto Rico, thinks the ward needs a new leader who will effectively represent their interests. “I am a Latina, living in a 52-percent Latino community that has never had [that] representation,” she said. She promises to fight for accessible education and affordable housing for all families, including immigrants. Rodriguez Sánchez knows what it feels like to be displaced due to economic insecurity. A decade ago, she was forced to move from Puerto Rico to Chicago as the island faced unrelenting austerity measures and a fiscal crisis. Her experiences living under the oppressive hand of U.S. colonialism, as she sees it, and her roots in community organizing have deeply informed her membership in the Democratic Socialists of America political party. For too long, politicians like her opponent Ald. Deb Mell have overlooked calls by many of her neighbors for immigration reform, affordable housing and accessible education, she said. Rodriguez’s experiences fighting for clean water, public schools and political independence in Puerto Rico in many ways mirror the fight she now faces in Chicago. At six years old, Rodriguez Sánchez was already getting a taste for organizing. On the eastern coast of Puerto Rico in her neighborhood of Mariana, the government redirected the community’s water to a military base, leaving very limited clean water for local residents to drink. Her father, with Rodriguez Sánchez at his side, participated in community protests, eventually winning back access to the water, she recalled. “If you want to have access to the things you need, you’re going to have to demand them,” Rodriguez Sánchez said. Later as a teacher in Puerto Rico, she fought against the privatization of education and the mass closure of public schools on the island, issues she sees playing out similarly in Chicago. In her own classroom, she saw first-hand how budget cuts starved the island’s education system, and she struggled to get adequate materials for her students. Frustrated and exhausted with the employment and education situation on the island and the impact of austerity measures instituted to curb the island’s debt, Rodriguez Sánchez made the difficult decision to leave the only home she’d ever known and move to Chicago. “Coming to Chicago was very traumatic,” she said. But diving into community organizing in her new Albany Park neighborhood helped her heal. Along the way, her fellow organizers began to plant the seed that she should run for political office, she said. At first, her answer was an emphatic “no,” as she didn’t believe in electoral politics as the solution to change, she said. Due to its status as a territory, Puerto Ricans living on the island cannot vote in the presidential or congressional elections. They have no representative with voting power in Congress; they can only elect a resident commissioner who holds minimal influence. But when Sen. Bernie Sanders (I-Vt.) ran for president in 2016, Rodriguez Sánchez started to turn her head toward the political stage. Sanders’ campaign, organized by many community activists, advanced progressive agendas like universal healthcare and living wages. It inspired her. Rodriguez Sánchez started to imagine the possibility of building a progressive Chicago City Council responsive to the demands of community organizers and residents. “How do we get into those offices and open them up?” she wondered. In 2017, she launched her campaign for city alderman. Rodriguez set up her campaign headquarters on a bustling thoroughfare in the ward’s Albany Park neighborhood. Just down the block from the humble storefront-turned-political hub, sits Betty & Nick’s Hair Salon. On an overcast Friday in March, Denise and Irais Valero waited inside the buzzing hair salon alongside fellow locals for a haircut. The women live in the ward and plan to support Rodriguez Sánchez in the upcoming election. They want a candidate who will protect immigrants by strengthening Chicago’s Welcoming City Ordinance. “[ICE] can randomly grab one of my family members and someone I am really close to, for no reason,” Denise said. Denise and Irais had an opportunity to meet Rodriguez Sánchez on a recent Sunday as they were leaving church. The encounter left an impression on them. Although Rodriguez Sánchez was born in the United States and has citizenship, she said she still understands the barriers and racism immigrants experience. “I identify with them [when it comes to] what it takes to build your home somewhere else when you have to leave everything you know,” Rodriguez Sánchez said. To that end, Rodriguez Sánchez promises to bolster the welcoming city ordinance, eliminate the city’s controversial gang database — which includes disproportionate numbers of black and Latinx people and has been used to put some in deportation proceedings — and advance a civilian police accountability board to halt the targeting of immigrants by local law enforcement. Rodriguez Sánchez says her campaign is rooted in her belief in accessible, public services so that all people can not just survive, but thrive. Incumbent Ald. Deb Mell has faced criticism from community organizers for her connections to real estate developers, and her neglect of low-income residents, as critics describe it. Mell does have a record of advancing tenant rights and voting against property tax increases. But some residents said it wasn’t enough. “I’ve been living here in this area, going on 15 years,” Denise Valero said. “And I’ve seen the drastic change.” New development came into the neighborhood, rents climbed and families were forced out, she said. Denise considers Rodriguez Sánchez’s positions on affordable housing a refreshing departure from the current alderman. Rodriguez Sánchez promises to fight for rent control, a progressive property tax, and aggressively build affordable housing. The city of Chicago contends with massive unfunded pension obligations and debt, leading many politicians like current Mayor Rahm Emanuel to slash public services and jobs in the name of fiscal responsibility. Like Puerto Rico, Chicago has closed scores of public schools, laid off public workers and closed public clinics. She considers the connecting thread between her three decades in Puerto Rico and her home in Chicago to be one of fighting: fighting for access to resources and fighting for the people. It’s a tactic that she’ll be taking with her to the elections on April 2. Featured photo: Rossana Rodriguez Sánchez, center, with supporters after Chicago’s Feb. 26 election. Photo by Justin Agrelo.